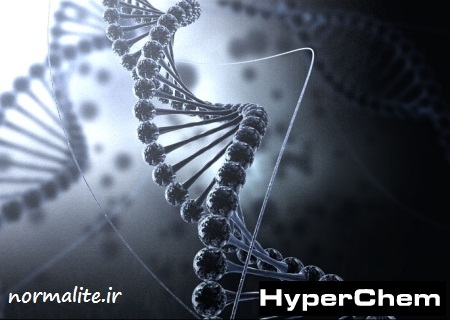 HyperChem نام یک نرم افزار حرفه ای برای شیمیدان ها می باشد. به کمک این نرم افزار افرادی که در زمینه شیمی فعالیت می کنند قادرند تا بسیاری امور مختلف را که قبلا بر روی کاغذ و یا به صورت دستی انجام می داند به صورت نرم افزاری و سه بعدی به انجام رسانند. این نرم افزار قدرتمند از قابلیت هایی همچون توانایی نمایش ساختمان های مولوکولی به صورت سه بعدی با قابلیت چرخش ، انتخاب ، تغییر اندازه و کنترل به وسیله موس برخوردار می باشد. این نرم افزار محصولی از شرکت MakoLab می باشد. - Draw any atoms and/or bonds involving H, C, N, O, F, P, S, and Cl. - Single, double, triple, and aromatic bonds. - Model builder to create 3D structure. - Render as sticks, ball and stick, ball and cylinder, overlapping CPK spheres or tubes. - Rotation, translation, and zooming of structure (using only finger gestures). - Selection to explore bond lengths, bond angles, and bond torsions. - Internal rotation of side chains. - Alignment along axes and translation of selected atoms. - Saving and restoring of molecules from local storage. - Local help file as well as wireless acess to help at HyperChem Site. - All features of Free Version. - Requires access to a copy HyperChem for Windows 8.0.9 (or later) for additional capability. - Wireless login to HyperChem (with password) at any IP address where HyperChem resides. - Simple setup of HyperChem to act as Personal Server (PS) at its current IP address. - Send any script to PS for execution - such as optimization, calculation of vibrations, energy, etc. - Transfer results (structure or log files) back to mobile device from HyperChem PS. - Create and save scripts locally on mobile device. One button execution of any script. - Save computational result files from PS onto mobile device for later perusal. - PS can restrict scripts to specific computation with specific log files for educational use. - Restricted to a single connected user at a time. User must disconnect to free PS for next user.